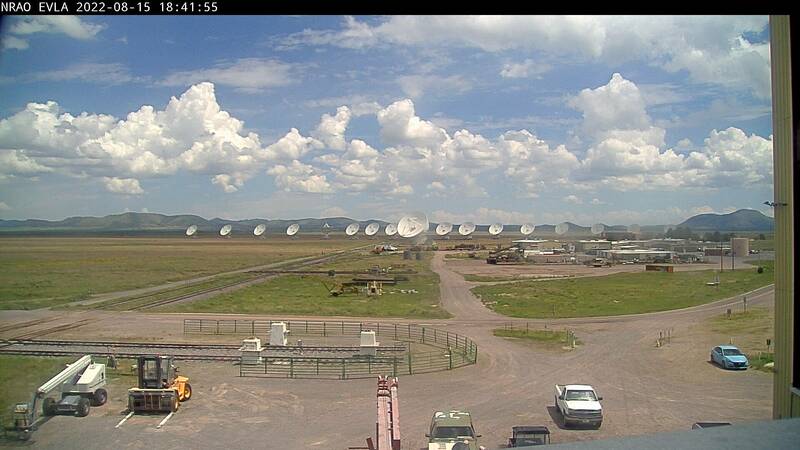 You’re looking at a live view of the VLA. The camera is mounted on our Antenna Assembly Building, also known as “The Barn.” The camera gives a view toward the northeast, and updates every 15 seconds. The number of visible telescopes and their locations will depend on which configuration the VLA antennas are in at the moment. The antennas work together, so usually all the dishes will point in the same direction. You might see a dish or two pointing straight up, which means it is probably in maintenance mode. We have a three dish rule, where up to three dishes can be in maintenance mode and the science still gets done. How many dishes are in view? Which configuration do you think the VLA is in? You can find out here. Are any of the dishes in maintenance mode?